JustNick – tagged "clique kits"
I hope you all are enjoying these beautiful Summer Days (the current season here in Canada!). After a long vacation to my native Ecuador, i am finally back home and loaded with lots of ideas, and memories to document. For this particular picture of my cousin and my goddaughter, i used one of the newer cut files , Frilly Floral Frames, to create its soft and girly background. My starting point was to create a grid design for the page, but once I started playing with the frames on my Silhouette software, I was drawn to the visual triangle the three frames formed around the picture. So I went ahead, and welded the 3 frames together, to create the cut out for this page. 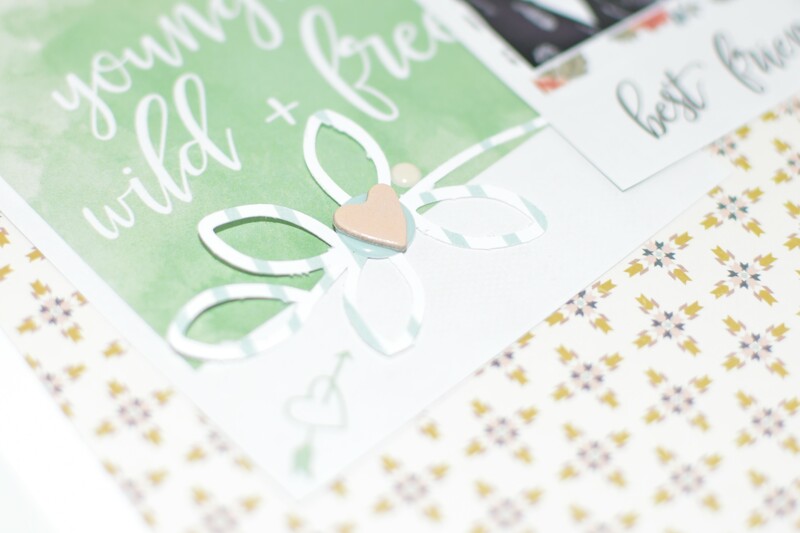 Once the cut out was created, i backed the flower in each corner with some of the papers from Cocoa Vanilla's Wild at Heart collection that was included in the May 2017 Clique Kits monthly kit. Since i wanted the layout very girly, i chose to use one of the papers from the collection as the background for the page. The watercolor design in the page brings the details in the white cut outs. In addition, a layer of white vellum was added to the squares (as a layer behind the cut out) just to the sections where the square do not intersect. Using a paper piercing tool, a stitching guide was created around the edges of the squares. Three different color embroidery thread was used to stitch the frames, so that they match the colors in the background paper. For the title of this page, the "You Make Me Smile" cut file was used to stitch the "You & Me" sentiment to the page. Once the stitching was completed, a bit of shimmer watercolor complete the look of the title. This same watercolor was used to create the splatters around the page. I really hope this inspires you to take a look at the new designs available at the Just Nick Studio store. The versatility of each of the designs will allow you to create a one-of-a-kind project. Remember, I am a comment away if you have further questions on how this came together. Hello, everyone! Donna here sharing my first layout for the month of May. I created a simple scrapbook page about me and my dear friend. I printed this photo long time ago but just used it for my project today. It was taken at The Kingdom Tower in Riyadh when we went there together with our families. I've been into subtle colors lately and that's what I did here with the flowers and the butterflies which I think matched perfectly. I used a mix of pink, yellow, orange and green watercolor to coordinate with the colors of the papers and embellishments I used. I love the sweet colors in the "Sorbet" kit by Clique Kits. I used the Delicate butterflies cut file as a stencil. I carefully brushed watercolor to outline the shape of the butterflies. And once dry, I wrote a bit of journaling in the butterflies and added puffy hearts in some of them. I layered some paper strips, messy thread, scattered colorful sequins and other embellishments. That's all from me today. I hope you liked my page. Also, don't forget Just Nick is celebrating it's 2nd year anniversary with an awesome sale! Hi everybody. Nicole here with a fun mixed media layout. Every once in a while, I like to get messy and when I say messy, I really mean it. By the time I completed this layout, my fingers were stained purple and teal. What a pretty combination! For this layout, I used the Kaleidoscope cut file. This looks so pretty inked up. I decided to use the digital cut file as a stencil and embellishment for my layout. I used Clique Kit's April kit to decorate my layout once the mist was dry. I used a few floral stamps by Altenew complete the layout. The layout looked like it needed more so I pulled out my stamps and started stamping and cutting the images from patterned paper. Thanks for visiting today. I hope you have a great week! Donna here sharing a layout using one of the newest cut files in the Just Nick Studio store. I missed a post last time because my computer broke and the Silhouette studio software kept on crashing on hubby's computer. But I finally got my computer and Silhouette running!!! And hubby got me a new printer too!! I have to figure out how to set it up first but I am excited! I created a border around the white cardstock by cutting different lengths and widths of paper strips from my Clique Kits April "Jellybean" kit. I brushed black watercolor to the alpha stickers to make it stand out against the colorful background. That's all from me today, I hope you liked my project! I used one of the exclusive cut files created by Just Nick Studio for the June Kit "La Dolce Vita" featuring Elle's Studio Little Moments. After writing a bit of journaling using a waterproof pen, I used my brush to flicker tiny bits of diluted gelatos and let it totally dry. You can still join the hop and start right on the Clique Kits blog. Tarrah here and today I am excited to share my scrapbook layout for the recent blog hop that was held between Just Nick Studio and Clique Kits! 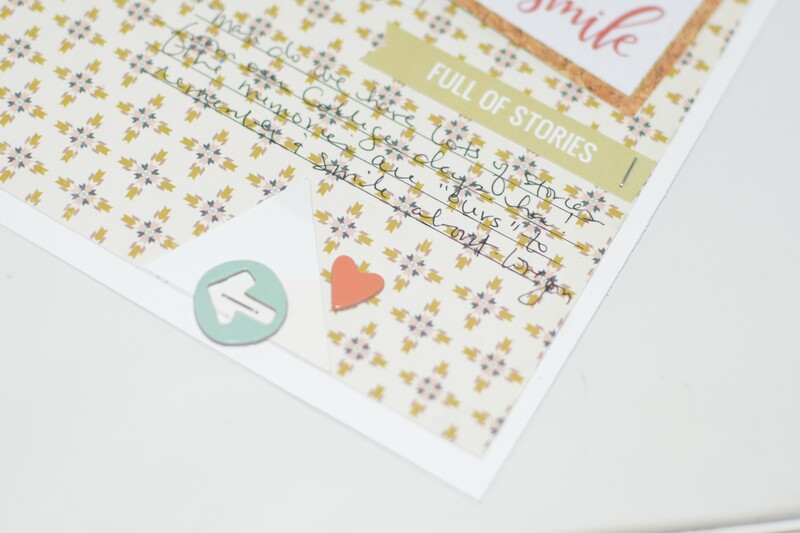 I absolutely love the Elle's Studio Little Moments papers and embellishments that were included in the June Clique Kit! They matched perfectly with the cut files we were given to use with these beautiful kits. I chose to use the beautiful butterfly cut files and I enlarged it to fit across my layout to sit above the 'Enjoy the Little Things' sentence. We are excited to be teaming up with the folks at Clique Kits again this month using their June kit ! We have created a few exclusive cut files to co-ordinate with this month's kit - please join us in a blog hop today to check out all the projects made for our Team Up! I cut the floral background from some Elle's Studio paper in the kit and then backed it with several other papers in the kit. I couldn't resist adding in lots of the Elle's Studio tags and diecuts in the kit, so I added some along the left edge of my page. There were so many goodies in this kit and it was such a pleasure to work with it! You have a chance to win a $15 GC to the Clique Kits shop! Just leave a comment at each post along the way to be eligible to win! We are super excited to be teaming up again with our friends at Clique Kits ! Some of our designers were sent the June kit (available now http://www.cliquekits.com/) and we can't wait to share our projects with tomorrow! This kit is full of exclusives along with some fantastic products from Jillibean Soup and Elle's Studio! Make sure you stop by the blog tomorrow for the hop and to have a chance to win a gift certificate to the Clique Kits store! Hello! It's Donna here to share my first layout for June on Just Nick's blog. For my page, I used the Flowers in Bloom background cut file. First, I brushed water on the cut file background before brushing yellow gelato. To add a touch of pink, I used Vintage pink chalk edger diluted in a bit of water as well. After it has dried, I adhered it to the patterned paper as you see in the image. After adhering everything, I splattered some mists/inks to the layout. Then I wrote my journaling after the ink/mist splatters dried. Hello everyone. Hope all is well. I decided to play with the Lazy Daisies cut files again. I love the fact that these cut files can be layered together to add dimensions to any project. Not only did I layer my flowers, but I layered several different types of patterned paper and embellishments on this layout. I love how this turned out. Patterned paper: Die cuts: Elle's Studio, Thickers: American Crafts, Flair: Clique Kits, Chipboard: Bella Blvd., Enamel Dots: Richard Garay, Simple Stories, Lazy Daisy Cut file: Just Nick Studio. Here are a few close-ups of my project. For more texture, I used a stencil and whipped spackle after the gel medium dried. Using the shapes from the cut file as template, I traced this over different patterned papers and placed them in random spaces. I used different shades of Faber Castell PITT pastel pencils to darken spaces of the cut file background and doodled around the pieces of patterned papers with black pen to make it stand out. I had a lot of fun making this page. Would you try this kind of background technique on your next layout? Let me know when you do! Hello and happy Monday! It's Jaclyn joining you today. If you've been following along on the blog during the month of February, you've seen the posts and projects featuring our team up with Clique Kits. I have post a here showing two pages I created with the Hot Mess kit and the exclusive Just Nick cut files. This pairing, of the kit and cut files, has been so inspiring though, I just can't stop creating with it! So, I've got one more page to share with you today, using the exclusive zebra background. I have a silhouette portrait machine, which if you're familiar, limits me to cutting files that are only eight inches wide. Because of this, I sometimes avoid using background cuts, but this one was to good to shy away from. Being unable to use a background in the traditional sense, that would cover both the width and length of my 12x12 canvas, often encourages me to get more creative, as I've done on this page. At first glance, you'll see that I sized the file down to about 6.5"x7.75" inches and cut it from solid black cardstock. I then backed it on a white background piece to mimic traditional zebra coloring. It acts as an oversized matting to my photo and home to my title and collage of embellishments. Upon further inspection, you might notice the 'real life' tab that sits directly under my title. The tab is used to alert the reader that there is much more to this page. In fact, the tab lifts to reveal a whole slew of journaling hidden under the zebra print cut design. This was a great way for me to have fun with the design and embellishments of the page but still find a way to include the whole of my story. Thanks so much for joining me today! I hope this post inspires you to utilize your background files in new and creative ways. If so, we hope you'll share them with us! It's Donna here today to share another page I created using one of Just Nick Studio's awesome cut files. Today's page is quite simple. I used the cut file Enjoy the moment as my page title. I layered two of the same sized cut file to add a bit of interest to my title since I only used plain white cardstock. I still wanted it to stand out against the soft pastel colors on the background. Hope you liked my page today! 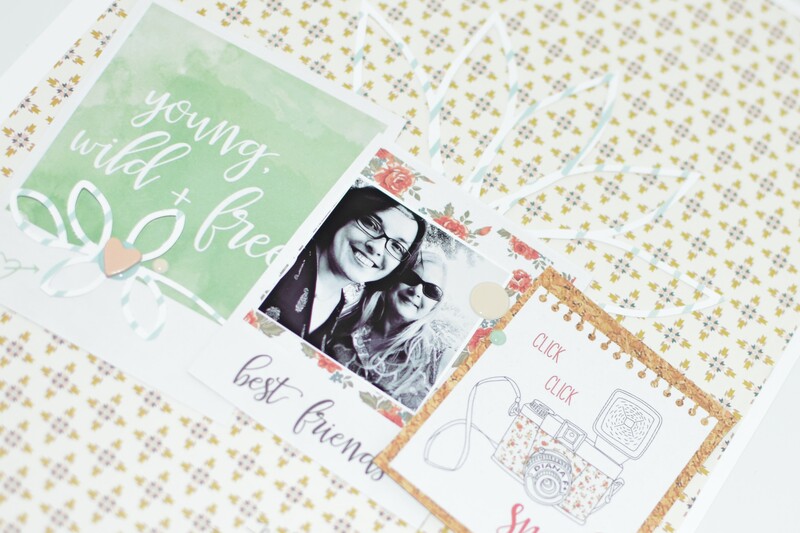 I hope you were able to make it to our joint blog hop, this past weekend, with Clique Kits. I had a lot of fun using their February Hot Mess kit and, of course, using the awesome cut files from Nicole. Today I'm sharing the page I created for the blog hop. It's a fave! I love layering and layering cut files is just as fun as layering pattern paper! For this page, I duplicated that awesome art in various sizes. Then, cut them out and layered a couple of the smaller ones on the top right. I cut out the word Shine and used some of the mist, from the kit, to color it up. LOVE that color, don't you??? This layout is documenting a milestone in my life after working really hard on my health in 2015. It's just the beginning! And what a fabulous kit to work with, too! Cut files used: Exclusive cut files for January 2016 Clique Kits kit.